about this book: Hard Times is about a young man named Nathan Washington and his quest for redemption after years of running from the law whose been chasing him his whole life after a daring escape from a Georgia Chain Gang. The former Heavyweight Champion of the World is found after 50 years of hiding, suffering incredible hardship after leaving his wife and kid behind to escape his past. 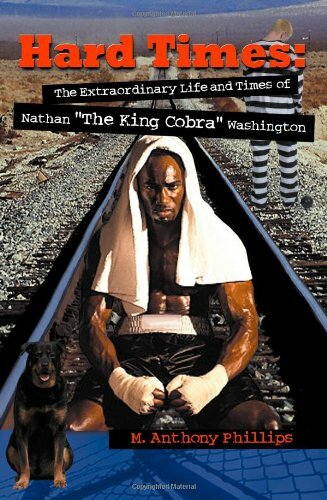 Nathan is asked to re-tell his life story to a Los Angeles sports magazine in order to seek a pardon in return. An old man in every way, Nathan knows this is his only way to become the man he once sought to be before injustice got in the way. I was inspired to write this book after writing a screenplay I wrote that circulated around Hollywood that got noticed and then scrapped. I chose the cover and had it customized to depict what I saw Nathan to be. I hope readers of adventure stories will gravitate towards this book and rejuvenate interest. It's a good read.